My 13-year-old daughter was about 8 years old when she announced that she wanted to be a “real” vegetarian. Not the kind she’d been for a few years where she’d indulge in her grandmother’s roasted chicken twice a year or scarf down the occasional carnival hot dog. A vegetarian myself, I knew that ensuring Chloe got enough protein and iron was vital. I give her some soy, primarily tempeh, because it’s less processed than tofu and it’s fermented, which is supposed to help digestion. But given the constantly shifting barometer on soy’s healthfulness, she doesn’t get it often. I also try to avoid other processed protein sources like whey and even rice. I’m a big believer in the less processed, the better. 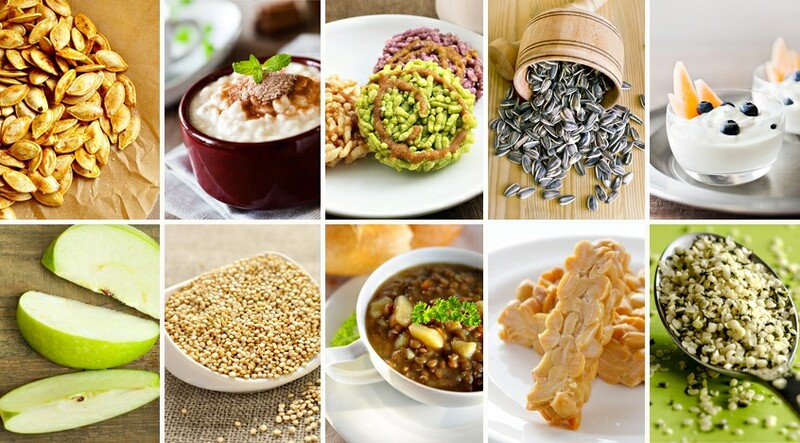 Throughout the years I’ve collected go-to protein-rich snacks that are quick, affordable, healthy, unprocessed—and meatless. I know parents are constantly looking for healthy snack options, so here they are. Remember, these are great snacks even if your child does eat meat, and many contain fiber and essential fatty acids. Rice pudding: If you make this with whole organic milk, eggs, brown rice and brown sugar, it’s a very healthy, protein-rich snack. You can add raisins if you want. Pumpkin seeds: You can either buy them already roasted and salted or do it yourself (roast raw seeds with oil until they pop; toss with sea salt). Sunflower seeds: For some reason seeds are often eclipsed by nuts. I don’t know why, since they are rich in protein and great oils. You can get a sack of organic sunnies at a natural products store for pennies. Roast them with some olive oil and sea salt or tamari. Peanut butter on rice crackers: For little kids, create a happy face with raisins. Switch it up with sunflower and almond butter. Sliced apple to dip into a nut butter. Toasted hemp seeds: I am getting really into these gems. They taste great, have a fun crunch, and pack a lot of protein along with those hard-to-get essential fatty acids. You can toast them yourself and add sea salt or buy them already prepared at most natural products stores. Tempeh: I prefer this to tofu because the soy hasn’t been as processed and is fermented—serve it with sauces that appeal to kids. Lentil soup: My daughter eats this at least twice a week. If you don’t have time to make it, grab some cans of organic lentil soup at the grocery store. Try topping with grated cheese if your eater turns his or her nose up. Greek-style yogurt: This packs way more protein than other yogurt styles. Although I’m not a big fan of low- and non-fat foods, I do opt for low fat here, or I find it’s simply too rich. Quinoa: I often cook a pot of this great protein-rich grain and use it all week long. Top a warm bowl of quinoa with grated cheese or some tamari. On a chilly morning or afternoon, top warm quinoa with honey or maple syrup, butter and cinnamon.